Students enjoying their field trip in Wichita involving safe driving among teens. Students along with Amanda Londono the school resource officer at Salina Central High School went on a field trip involving safe driving and teen traffic safety. Students and Officer Amanda Londono went on a field trip involving safe driving and teen traffic safety. 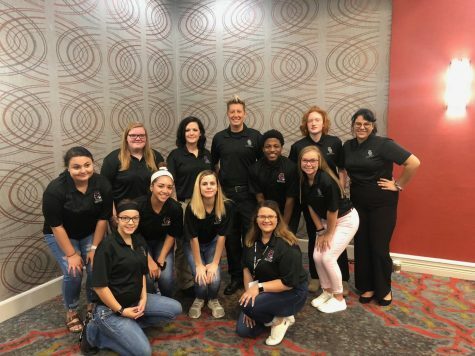 “The conference is Kansas Teen Transportation Safety Conference where kids can interact and network while learning about traffic safety. They learn ways to bring a traffic safety message back into our school settings,” Londono said. In the program they share experiences, and hear people’s life changing traffic accident stories. Junior Saria Taylor also attended the trip to Wichita Kansas along with the seven others. He said, “The purpose is to keep young teens aware of dangers on the road”. The program not only talks about ways to drive safer, but it also works on core skills such as working with others. “I love it. It’s a good way to get young adults aware of what’s going on around them, and to help us learn how to protect ourselves,” Taylor said.